What is an image guided lumbar epidural corticosteroid injection? The spine is made up of bones called vertebrae. Between each vertebra is a ‘disc’ that allows the spine to be flexible. 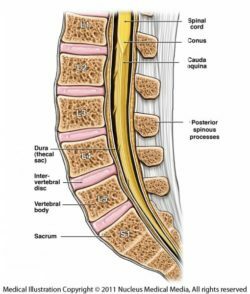 The epidural space separates the bony spinal canal (the space in the vertebrae through which the fluid filled sac containing the spinal cord passes) from the fluid-filled tube or sac. The nerves to the various parts of the body travel through this space to leave the spinal canal. An image guided lumbar epidural corticosteroid injection is the accurate placement of a very thin needle, at a given level in this space, under guidance with computed tomography (CT) or X-ray images or pictures to inject corticosteroid (or ‘steroid’) and usually a long-acting local anaesthetic. The most common reason for your doctor to recommend this procedure is severe or prolonged (chronic) back pain that may or may not go down into your leg or buttock on one or both sides. This procedure is most suitable for people whose back pain is a result of disc or facet joint problems related to ageing and arthritis. It is not recommended for back pain as a result of other causes, such as cancer in the spine or infection. For this reason, it is usual that you will have a CT or magnetic resonance imaging (MRI) scan of the spine to ensure that there is no cause other than age-related changes in the discs and facet joints to explain your back pain. Epidural corticosteroid injection can sometimes be recommended by your surgeon if you have recurrence of your back pain after surgery. This recommendation will usually come after you have had an MRI scan of the spine to ensure that there is nothing that needs further surgical treatment. Short-term back pain is best managed by maintaining your normal activities and taking simple analgesics, such as paracetamol, until the pain goes away. Sometimes the pain persists and interferes with normal activities and sleeping. When this happens, other ways of relieving the pain, including epidural corticosteroid and local anaesthetic injection, may be recommended by your doctor. How do I prepare for an image guided epidural injection? Because you will be lying on your stomach during the procedure and will be uncomfortable if your stomach is too full, it is advisable to limit food intake to a light meal only, up to 2 hours before the procedure. It is recommended that you do not drink anything in the 2 hours before the procedure, and you should go to the toilet right before you have the procedure. This is because the local anaesthetic used for this procedure can mean you will not feel your bladder filling as you normally do. This will wear off within an hour or two. You should wear comfortable clothes that are easy to remove and leave jewellery at home. Please note that some of the disinfectant agents used during these procedures may stain light-coloured clothing. When you make your appointment for the image guided lumbar epidural injection, you need to let the radiology clinic or department know if you are taking any blood thinning medication, such as warfarin, clopidogrel, dabigatran, prasugrel, dipyridamole or asasantin. (For more information about these medications, go to NPS: www.nps.org.au/medicines). If you have problems lying on your stomach, please advise the practice or hospital when you make your appointment, as this can make the procedure difficult and the radiologist (specialist doctor) carrying out the procedure needs to be made aware of this. You may be monitored by nursing staff while you lie in a bed in the observation ward for approximately 2 hours before you are allowed to leave. You will need to have someone take you home, because you are not allowed to drive immediately after the procedure. What happens during an image guided lumbar epidural corticosteroid injection? You will be asked to change into a hospital gown and leave your belongings in a locker. You will then be asked to lie on a table on your stomach and this table will either be in the CT scanning room or in a fluoroscopy suite. In both cases, there is equipment over or around the table that allows the radiologist to use X-rays to guide the needle placement. The table will have a thin foam mattress on it and you will have a pillow for your head. A metal marker will be taped on the skin of your lower back and images or pictures on the fluoroscopy equipment or the CT scanner will be used to adjust the position of this marker so that it is at the correct level for the injection. The skin will be marked with a pen or felt marker to indicate where the needle will enter the skin and the metal marker will then be taken away. The skin is cleaned with an antiseptic and a drape may be placed on your back. A local anaesthetic injection is used to numb the skin and deeper tissues. This is uncomfortable for a few seconds, producing a pin prick and a stinging sensation. You will be awake and only the area where the lumbar epidural injection is being carried out will be numb. When the skin and muscles are numb, a thin spinal needle is then guided into the spinal canal and into the epidural space. The placement of the needle in the epidural space is checked by the radiologist by injecting contrast medium (X-ray dye) or air. Contrast medium enables the CT to show the area inside the body where the procedure is being carried out more clearly on the images. Once it is confirmed that the needle is in the correct position, a mixture of corticosteroid and (in some radiology practices/hospitals) a long acting anaesthetic is/are then injected. The pressure of the injection may momentarily increase the pain, but this is generally quickly relieved as the local anaesthetic takes effect. Are there any after effects of an image guided lumbar epidural corticosteroid injection? Depending on the spread of the local anaesthetic, you may feel total numbness of both legs or one leg for up to 2 or more hours. Your blood pressure may drop temporarily, as a result of the local anaesthetic, so you will be asked to lie in bed flat on your back, stomach or side, because sitting up could make you feel dizzy. Your lower body and legs may feel ‘flushed’ for a short time. You may not notice that your bladder is full and may not have the usual control over your bladder in the first couple of hours after the procedure. If your bladder is full, this can sometimes lead to leakage of urine (urinary incontinence) and this is the reason for suggesting that you empty your bladder right before the procedure and not drink anything for a couple of hours before the procedure. How long does an image guided lumbar epidural corticosteroid injection take? The procedure takes no more than 15 to 20 minutes under CT guidance. It may take longer if X-ray is used. The time taken for full recovery, leg function, bladder function and blood pressure normalisation is approximately 30 minutes to an hour. Some patients require upwards of 2 hours. With preparation time, you should allow 4 hours between entering the radiology practice or hospital and leaving again. You will not be allowed to leave until your legs and bladder function are normal, your blood pressure is normal, and you are able to sit up and walk normally without feeling dizzy. What are the risks of an image guided lumbar epidural corticosteroid injection? Increase in your back or leg pain during the injection, which is temporary and relatively common. It is expected and is not considered a risk of this procedure. In experienced hands, the overall risk of minor complication is less than 1%. If contrast is used to check the needle position, there is a small risk of an allergic reaction. The risk of a very serious reaction is less than 1 in every 100,000 (see Iodinated Contrast Media), but more minor contrast reactions (such as itching and swelling of the face) occur more often, in approximately 1 in every 100 to 1 in every 1000 people. Many radiologists use air, rather than iodinated contrast media, to check that the needle is in the epidural space before they inject corticosteroids. If air is used, you do not need to worry about having an allergic reaction to the contrast media. Allergic reaction to the local anaesthetic used in the skin or mixed with the corticosteroid is very rare, but does occasionally occur. It is similar to a reaction to iodinated contrast and is treated by the radiologist in the same way (see Iodinated Contrast Media). Urinary retention is an uncommon complication of this procedure. It means you cannot empty your bladder. It will require a thin tube (catheter) to be passed into your bladder through your urethra (the passage leading from your bladder to the outside). The catheter will then be taken out. You will need to stay in hospital or the practice until your bladder function returns to normal.This side-effect generally only occurs when large volumes of anaesthetic are used to relieve pain. It is more common in men who already have some problems with bladder emptying as a result of an enlarged prostate. If the fluid sac (known as the thecal sac) is punctured by the needle, there may be a quite severe headache for a few days. The risk of headache after sac puncture is less than 5%. It is worse with sitting and walking around, and better if you lie down and take lots of fluids and simple pain medication, such as paracetamol. Puncture of the fluid sac occurs occasionally and means the procedure needs to be stopped, because local anaesthetic and corticosteroid should not be injected into fluid sac (see point 6 below). As a result,you will need to be rescheduled to have another attempt in approximately 1 week. This most often happens when the spinal canal is very narrow as a result of disc disease or arthritis and the epidural space is extremely narrow or non-existent, making it hard to position the needle in this space. The radiologist is generally aware that this has occurred, because fluid (cerebrospinal fluid) comes back up the needle. If you are rescheduling your procedure after thecal sac puncture, you must wait several days to a week to allow time for the tiny hole in the thecal sac to seal over before another attempt occurs. Corticosteroid injection into the fluid sac instead of the epidural space rarely occurs as a complication of this procedure. If it does, there are usually no side-effects. Very rarely, this can produce long-term inflammation called arachnoiditis. This may lead to long-term leg and back pain. Bleeding into the fluid sac may also result in arachnoiditis. Infection of the epidural space and of the fluid sac are rare, and minimised by using sterile technique, but possible if there is skin infection close to the puncture site. This is a serious complication and can produce meningitis. Meningitis produces severe head and neck ache days after the procedure, and you will generally feel unwell and may have a fever. It needs to be treated urgently in hospital with antibiotics through a drip (a small plastic tube inserted into one of your arm veins). Bleeding into the epidural space is also rare and called ‘epidural haematoma’. It is much more common if you are on blood thinning medication that is not stopped before having the procedure or you have a blood clotting problem. It causes increasing or persistent back pain after the procedure, and may cause weakness in one or both legs and difficulty emptying your bladder when you go to the toilet. It needs to be treated in hospital and may require surgery to relieve the pressure it causes on the nerves. CT guided epidural injection is carried out with a very fine needle and an epidural haematoma is very rare. What are the benefits of an image guided lumbar epidural corticosteroid injection? Image guided injections are accurate and minimise the risks of complications. Very small needles can be used under CT guidance. Relief of back pain and avoidance of, or delay in surgery are the major benefits. The pain relief is often not permanent, but fortunately the injections can be repeated if and when the pain comes back. The generally accepted practice is to limit this to no more than three to four injections per year to minimise the complications of the corticosteroids. There is rapid pain relief if local anaesthetic is used and this may last 2–4 hours, but the pain may then return. The steroid takes approximately 48 hours to have effect. In some patients, breaking the pain cycle with the steroid injection results in pain relief, which is maintained for several weeks to months. Who does the image guided lumbar epidural corticosteroid injection? A radiologist or pain specialist (often an anaesthetist with a special interest in pain management) with appropriate training, using CT guidance or X-ray guidance. Image guided procedures have been shown to be safer than non-image guided procedures. Where is an image guided lumbar epidural corticosteroid injection done? An image guided lumbar epidural injection is carried out in a radiology department or practice, an operating theatre suite with suitable image guidance CT or X-ray equipment, or an angiography suite (again, within a hospital or radiology practice). When can I expect the results of my image guided lumbar epidural corticosteroid injection? how the report is sent to your doctor (i.e. phone, email, fax or mail). Please feel free to ask the private practice, clinic, or hospital when the written report will be provided to your doctor. Does the procedure need to be done under general anaesthesia? No. The most uncomfortable part of the procedure is the initial injection of local anaesthetic. After this, the rest of the procedure is usually not especially painful.